Looks great - sleek and well designed. None to speak of - works very well. Finished a sleek stainless steel exterior, the Sharp R27STMA silver microwave oven provides an ample capacity together 800w of power. The overall design looks smart, and will suit modern kitchens - the circular controls are well labelled, and the display easy to read. The brushed stainless steel will hide fingerprint marks, and thus maintain it's new looks - the overall look and feel is fairly minimalist. Build quality, as you'd expect from Sharp, is solid. It features 10 power levels, 8 different auto-cook menus, 3 express cook menus as well as 2 express defrost functions - all of which are controlled by the buttons located on the right hand side. Our testers found the controls pretty simple to use - it's nice to see a microwave that labels the controls well, rather than relying on symbols. 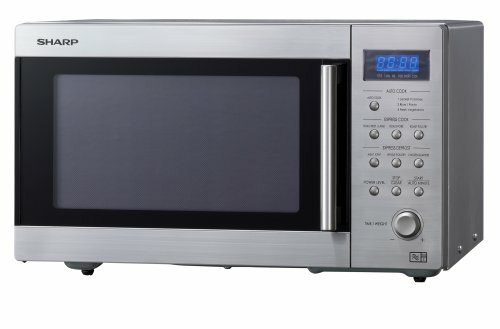 This model is a solo microwave - and so will not feature a grill nor a oven feature - please bear this in mind when purchasing. A well built and nicely designed Sharp solo microwave, with a reasonably large capacity.